IT takes a lot of hard work and sacrifice to grow a business — something that London-based property developer Paul Eden, the founder and CEO of Regal Homes, knows only too well. Eden left school at 16 and started earning a living by selling clothes at a local community market. He later got involved in the property industry and has not looked back since. Regal Homes was set up in 1998 and all its projects are in London with the majority of them being residential. The company also has in-house contractors, which, Eden says, allows it to be more involved in its projects. Moreover, he points out, most of its products are priced below £2 million (RM11.1 million). Eden met up with City & Country when he was in town recently to talk about his latest development, Royal Quay, which was launched in Kuala Lumpur on March 7. Royal Quay offers 90 partially furnished apartments with studio, 1-bedroom and 2-bedroom layouts. Taking up four storeys, the apartments have a built-up of 287 to 673 sq ft and are priced between £229,950 and £555,225. The guarded project has a gross development value (GDV) of £33.5 million. For those looking to invest in the units, the rents range from £275 to £520 per week, giving an estimated yield of 5% to 6%. Construction of Royal Quay began early this month and is expected to be completed in April next year. The development is a seven-minute walk to the Westferry Docklands Light Railway (DLR) station and will be accessible via the new Crossrail station, which will be completed in 2018. 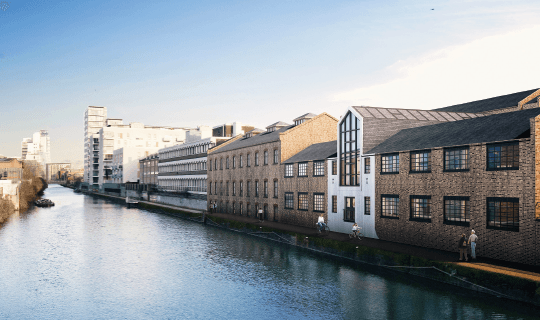 “What we’ve launched is a typical old warehouse conversion with bricks, and it is a really good-looking building. It has a lovely feel and a great courtyard … one side faces the road, which is extremely quiet, and the other faces the canal,” says Eden. As at March 9, Royal Quay was 42% sold. Eden says half of the buyers are investors and the rest, owner-occupiers. Royal Quay is also being showcased in Hong Kong and Singapore. Regal Homes has 1,400 to 1,500 housing units in the pipeline, which will keep it busy until 2019. According to Eden, these units are all in London and have a combined GDV of over £1.2 billion. Eden, 41, recalls how he started off selling clothes and gloves at a local community market. Back then, he would rise as early as 3am to set up his store even if the weather was -5° Celsius. “I managed to save up to start my own business, called In London Properties, just before my 18th birthday,” he says. In London Properties had a start-up capital of only £4,000 and its core business was residential sales, lettings and property management. Eden says he got his lucky break with In London Properties. “I designed a cut-out key and had the cut-outs put into the mail boxes [of potential clients]. It had a slogan that said, ‘The key to selling or letting your property lies in the hands of In London Properties’. All the local newspapers picked up the story,” he says, adding that this was before the Internet became popular. The exposure gave his business a boost. He sold the company six years later and set up Regal Homes with a capital of just below £100,000. He says the first apartment project he developed in Hampstead was the only one that incurred a loss. “It was an experience … and touch wood, I haven’t lost any money on any other project,” he says. Eden’s recipe for success seems to be one thing — hard work. But he adds, “I build my business by building relationships and being honourable. That is key to success in business. According to Knight Frank’s Prime Central London Sales Index February 2015 report, overall prices in prime central London have seen a 0.1% increase since September last year, driven by properties costing less than £2 million that are not subject to the proposed mansion tax. The Labour Party plans to impose this annual tax on properties worth over £2 million, should it come to power after the May 7 general election. According to a Savills’ Market in Minutes Prime London Residential Markets January 2015 report, properties priced less than £2 million performed stronger last year, with an average 2.6% growth year on year. This was because these transactions were less affected by the change in stamp duty following the Autumn Statement issued by the UK government on Dec 3 last year. The Autumn Statement is an annual update on the UK government’s plans for the economy. Savills’ report also points out that properties priced below £1 million recorded growth of 7.9% y-o-y and it forecasts a 46.6% increase for this sector over the next five years. However, it cautions that the overall prime London property market will see a 0.5% decline in value this year due to the general election. Nevertheless, prices are expected to move up over the next five years, with 23% growth by 2019. Will the general election curtail this growth? He says he will continue to focus on developing residential projects in London. He has no plans to expand beyond London because he believes in sticking to what he is familiar with. Moreover, he adds, investing in London is always the safer choice. This article first appeared in City & Country, The Edge Malaysia Weekly, on March 16 - 22, 2015.